The Artwiculate Word of the Day on 15th December was Statism – as I’m sure you guessed. I would just like to say that though many of the above statements are debatable, I think quite a lot of them are defensible. The illustration is one of a series I made a year or so back for another purpose. I may post them all here some time. They are based on art created during the First World War. 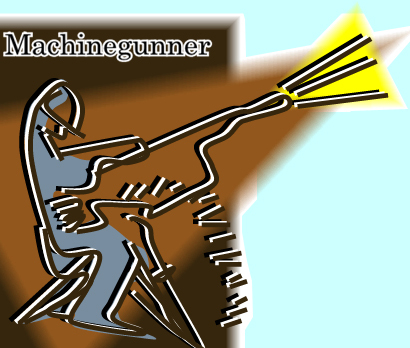 “Machinegunner” is based on a drawing by Henri Gaudier-Brzeska, â€œLa mitrailleuse en actionâ€, in the MusÃ©e National dâ€™Art Moderne in Paris.